Welcome to the Tropical Pyramid. The air is humid, warm, and fragrant, as tropical regions have warm temperatures that are constant from month to month. Please start the tour at the pyramid entrance. This map illustrates the five major tropical biomes. Follow the directions and read the plant labels to find the plants along the tour. Hint: 1 metre = 1 huge step. Click on the table of contents links to read about each plant as you find them. Please remain on the path and do not pick any plant material. Walk ahead 7m to see large palm-like cycads. 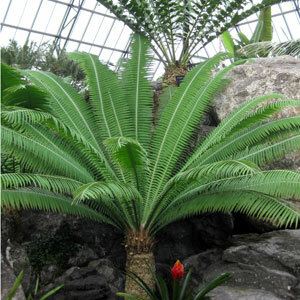 Cycads were around in the Jurassic period when dinosaurs roamed the earth. 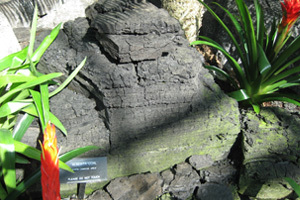 Look below the cycads at the coal, which is formed from ancient tropical plants. Walk down the path to the right to see the orchid hut. Orchids use unique shapes and smells to attract pollinators such as hummingbirds, butterflies, or wasps. 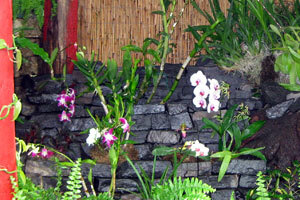 Orchids are common in jungles and can be found in every habitat except glaciers. Look up and all around. How many palm trees can you count? While there are a variety of palm trees around you, there are also some plants that resemble palms, such as the queen sago palm, which is a cycad, and the Australian tree fern. Which of the following products come from palm trees? 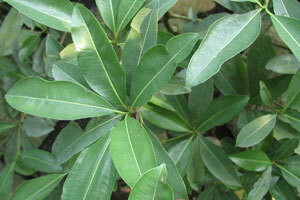 Walk right down the path 11m and look right to see a plant from South America, Sapodilla. 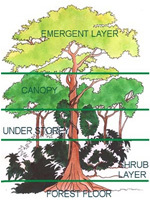 Look up at the forest canopy and notice how much light is let through the trees. In a typical rainforest, very little sun reaches the forest floor. Because of this, few plants will grow there. 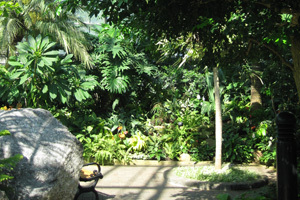 The Tropical Pyramid has a more open canopy and sunlight hits the ground, similar to a jungle riverbank or tropical savanna. 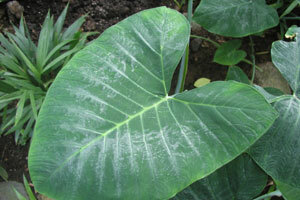 Look right at the taro (elephant ear plant), another important crop. Also known as "taro" and "dasheen"
Try out the pineapple quiz! Take a look at pineapple growing 12m down the path (around the corner on the right). From the pineapple walk 7m down the path. 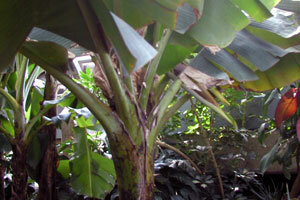 Look for a banana plant, it has some of the largest leaves in the pyramid. What other plants can you find that resemble animals in the four pyramids? Turn left before the bridge and head toward the Alexandra palm. Look up to see the elk-horn fern! You are now in the center of the Tropical Pyramid. We hope you can find your way out of the jungle! All of the above! 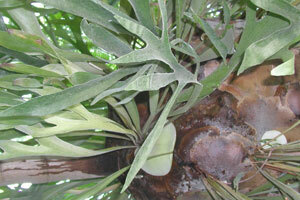 Palms are also used for starch and their leaves have many uses. Pineapples grow above ground and can grow in the soil or on other plants! Thank you for visiting the Muttart Conservatory and learning more about the Tropical Pyramid. There are more QR Code tours available in each of the pyramids. If you would like to take part in a guided tour of the pyramids, please visit on a Saturday or Sunday when we have scheduled drop-in tours. Please visit the Muttart Conservatory website and Facebook page for up-to-date information on upcoming special events and information about the facility.